Thank goodness I was able to eat more normally this week. Grilled chicken, oatmeal, bananas, even a tuna fish sandwich. Woo Hoo! Food never tasted better. When I weighed in on Saturday, I was up 2.6 pounds. I took it, with a smile on my face. Health matters! A woman cannot live on a can of Turkey Noodle soup and two yogurts a day. Ya just can’t. I slept so much, but such restless pained sleep. My energy level was low, too low to exercise in any way at all. And even though I was drinking lots of water mixed with iced tea — I’m sure I was dehydrated and nutrient deprived in more ways than I will ever know. So bottom line, Health is Important…and it apparently weighs 2.6 pounds. OK. Accepted! Gladly! Closer to normal, two weeks after my accident. I’m not sure how long it will take until it’s long forgotten and well behind me — but I’m grateful, G-R-A-T-E-F-U-L for how good I’m feeling. Thank you Lord for watching over me these past two weeks. 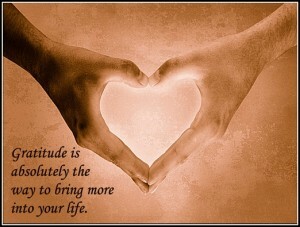 Gratitude is my middle name.